"A long time ago, before Sega Genesis and the world wide web, once a year a show came to town with the express purpose of blowing your mind." The curiosity and attraction of the original circus sideshow, where human oddities were displayed like so much beef, would rarely put a personal face on the attractions. The acts were billed as "freaks", and anyone willing to plop down a quarter could wander through the tents full of an array of unusual acts. This well-meaning and compassionate Learning Channel documentary, from 1999, does just that, and over the course of 105 minutes we learn not just the history of the sideshow, but more importantly, see the performers for the very real people they were. At one point, the narrative even travels to Gibsonton, Florida (or "Gibtown", as it is know affectionately), a winter home for travelling circuses, as well as a retirement town for former sideshow acts. 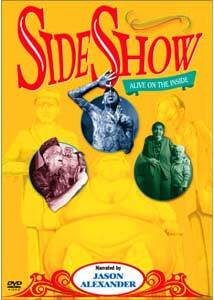 Narrated amicably by Jason Alexander, Sideshow: Alive on the Inside dabbles somewhat on the historical aspects of the sideshow, but at its real heart are the individual stories about such famous show folk as Jeannie the Half Girl, Schlitze the Pinhead, Melvin Burkhart, Ronnie and Donnie Galyon, and Percilla 'The Monkey Girl' Bejano. It is these personal and open segments that make this documentary such a rewarding viewing experience, and their often unflappable demeanor is both humbling and moving. In between the personal stories, there is an inside look at the workings of the so-called "amazement business". This is a history-rich documentary, if you're a sideshow aficionado that is, and the opportunity to sit down with the likes of Jeannie Tomaini or Percilla Bejano is a rare and rewarding experience. Even near the final twenty minutes or so, when the subject shifts to modern day acts like the Wolf Boys, Jim Rose or the new Coney Island, it becomes apparent that somewhere the era of sideshow still manages to live on, even in this politically-correct era. Still, hearing the old time reminiscences of some of the sideshow industry's biggest stars, now well into their seventies, is about as inspiring as anything you are likely to come across. Image Transfer Review: Presented in its original aspect ratio of 1.33:1, this made-for-television documentary looks much better than the ratty VHS copy I made when it aired on TLC back in 1999. Image quality varies, because some of the content is old black-and-white archival footage and some of the footage is a bit on the grainy side, but overall the presentation is pleasing and serviceable. Audio Transfer Review: A well-mixed 2.0 English stereo track is the sole audio option. Jason Alexander's narration is full and robust, as is the accompanying music. Some of the interview segments come off a little flat in comparison, but the subjects are always understandable. Extras Review: Not much in the way of extras, but what's here is good, despite being brief. The World's Smallest: Freida Pushnik (04m:30s) is a painfully sad segment that will challenge you not to shed a tear as Freida speaks of never having had a love in her life. If not, shame on you. Also included here is an automated Stills Gallery (01m:30s) of 23 assorted images. The disc is cut into 25 chapters, and does not feature any subtitles. Leave it to The Learning Channel to put a personal face on the sideshow. This highly-touted 1999 documentary is one of the best on the subject, and the material is heartfelt and honest. The show must go on. Recommended.